Podgorica is the capital city of Montenegro. 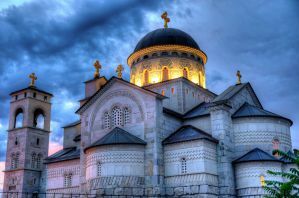 The city has undergone five name changes and passed through the hands of everyone from the Romans to the Turks to the Austro-Hungarians, and twice been wiped off the map entirely, so Podgorica has an interesting history and diverse culture. It can be difficult to pin a label on the city; its streets are a hotchpotch of Ottoman oddments, brutalist blocks and shiny new malls, and it has a fraction of the big-smoke buzz other European capitals can claim. But with some excellent galleries, plenty of parks and a vibrant cafe culture, pint-sized Podgorica is worth a look. The city sits at the confluence of two rivers. West of the Moraca is the business district, while the Ribnica divides the eastern side in two. The south side is Stara Varos, the old Ottoman town, dominated by the centuries-old Clock Tower, built by the Turks. While north is Nova Varos, home to a lively mixture of shops and bars. Its heart is Trg Republika, the main square. In the Zeta-Skadar valley south of the city, Lake Skadar National Park is home to medieval monasteries and beaches. Podgorica is a unique destination with plenty to offer and these hostels provide an excellent base for exploring the area. 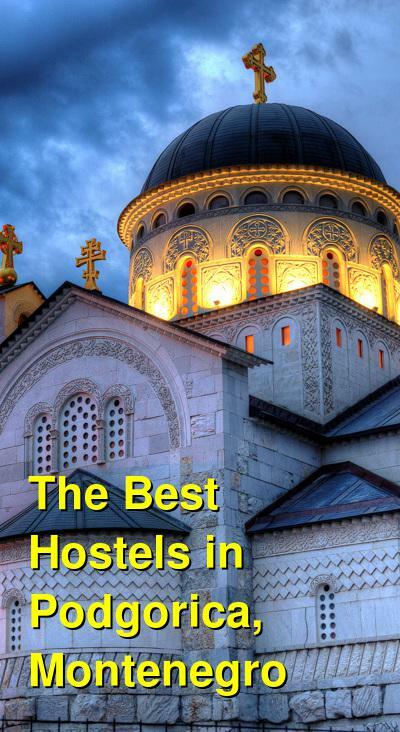 How much do hostels in Podgorica cost? and shopping center. The hostel organizes the cheapest airport transfer available as well as a cheap transport to the Albanian border. Free city maps are provided and the staff are happy to help with city tips and tourist information. The facility can help organize a rental car and help with public transit schedules. Parking, linens, towels, and Wi-Fi are all free with your stay. Montenegro Hostel (Rooms & Tours) Podgorica is settled in the old part of Podgorica named Stara Varos. The hostel is located in a modern building with a garden. This property has excellent facilities, location, and service. Montenegro Hostel Podgorica is one of the first hostels in Podgorica and is very popular among guests especially for its friendly atmosphere, quiet rooms, and walking distance of the city center. Montenegro Hostel Podgorica has 5 rooms: private double bed room (shared bathroom), private three bed room (shared bathroom), 10 bed mixed dorm (private bathroom ), 6 bed mixed dorm (private bathroom), and 6 bed dorm (shared bathroom). Hostel has a terrace on the roof of the building with amazing view of the bridges over the biggest river in Podgorica. Hostel also has a very nice garden, and car parking free for use. Next to the hostel is the beach on the river, where it is nice to relax in the summer season. The hostel has its own driver and car for any guest service and offers the cheapest price in Podgorica. The property offers a fully equipped kitchen, common room with terrace, and computers free for use. Linen, towels, kitchen, lockers, and Wi-Fi are free for use and breakfast is included in the price. Bike rental is also available. The facility also organizes transfers and tours at some of the best prices in the area. Hostel is newly furnished and it is decorated with handmade furniture in an industrial-rustic style. The garden is an ideal place to unwind, have a drink, or barbecue. Free city maps are offered and staff is happy to help with tourist information and tips on the city, they can even help with organizing tours on request. Free breakfast, welcome drink, free tea and coffee all day, free Wi-Fi, free towels and linens, free parking, free iron, free in garden parking for bicycles and motorbikes, are all available at the facility. TravelBreak is a great starting point for you to explore Montenegro. It is located just a couple of minutes walking distance from the city center, 500 meters from the main railway and bus station terminal. Location is perfect for all individuals or groups who visit Podgorica, whether they come as backpackers, tourists or business people who require their privacy and peace. The structure of the place has been designed in order to allow each guest a quiet and comfortable stay. From this location everything in the city is easily accessible. It&apos;s a perfect place for those who looking to combine style with great atmosphere. You&apos;ll find comfortable beds and a place where you can watch movies, listen to music, or chill out and relax with friends. The property offers air conditioned rooms, two toilets, one bathroom, a kitchen, safety lockers, TV, DVD/CD/RADIO Surround Sound System player, free WiFi internet access, free parking, and a nice garden with a BBQ area, playing cards, dominos, and more. Rooms are clean, enjoyable, in quiet and peaceful environment, with professional staff who will make your stay unforgettable, funny and relaxing. The facility has an age limit of 40. Hostel Nice Place is located in the city center and near the city stadium. It is set in a beautiful area, surrounded by greenery and hidden from urban congestion and noise, this hostel offers a great environment for a pleasant holiday. Near the hostel there is an abundance of restaurants that offer excellent service and cuisine as well as numerous bars, pubs, and night clubs that guarantee good entertainment. In addition there is a popular resort named Gorica which offers many sports and recreational facilities. Free parking, city maps, and Wi-Fi are included with your stay.